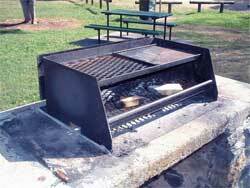 This BBQ is designed to be slab mounted and is fixed directly to an elevated concrete slab by 8 bolts. The BOOMER has a large self cleaning Hotplate and grille combination which provides for a generous cooking area for that large gathering in the park. This BBQ is designed to be slab mounted. It is bolted to tabs fixed into the concrete or, tabs bolted into the concrete. This BBQ is quick heating , using a minimum of fire. Easy to clean, with a built-on fat channel down each side, which returns excess fat and oil into the firebox. The Flue has a restraint at the top to deter would-be vandals from pushing firewood down into the chimney. A simple to use, robust addition to any Park where people like to gather. slab mounted. 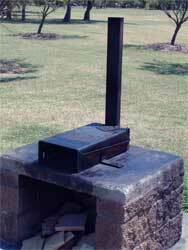 This quick heating, wood fired BBQ is an attractive pedestal mounted design. The mounting pedestal features a wood box and the design eliminates the need to install extensive footings. Excess fat from the cooking surface is channelled down each side to return to the firebox. 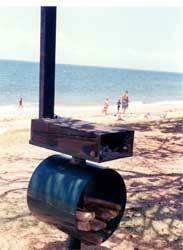 The unit can be bolted down or concreted in. or for intermittent use, bolted onto our optional heavy duty mounting plate, set flush with the surface of a concrete slab.